Peter and his crew eventually visited the farm on a Sunday in early-June. That evening, as dusk turned to dark, we dined on kilt greens salad, salt rising bread and chow chow in the front yard. There were seven of us — we’re all good friends now — seated beneath a few-dozen tiny light bulbs strung up between maple trees. In the center of the table, amidst a cluttered array of platters, glassware and ceramic dinner plates was a white and turquoise serving bowl half-full of pork and dumplings in a rich tomato gravy. The main component of that dish comes from a family recipe — “Aunt Floda’s Dumplings” reads the scribbled top line on a card in my grandma’s recipe box. My mom tells stories about these soft, fluffy squares of boiled dough — how they used to steal the show at Decoration Day picnics, or how, as a kid, she’d hike for miles to enjoy them at Aunt Floda’s house across town. They’re a simple, common food made from simple, common ingredients. But those dumplings mean something to me, and I relish opportunities to share them. Before the group’s arrival, Peter and I made plans for a day of foraging and cooking demonstrations, leading up to a picnic-style feast. We hiked into the woods and gathered mushrooms, dandelions and nettle leaves. I pointed out patches of withered ramps, fresh wood sorrel and aromatic wild ginger. We eventually backtracked through knee-high grass to the kitchen, where we baked a rhubarb upside-down cake, mixed a dandelion-sorghum dressing, and rolled out the dumplings just before dinner. After our plates were cleared, then replenished, and cleared again, Peter suggested we all join him for pork dumplings from his own family traditions, for Chinese New Year in early February. The warm season had barely arrived, but Peter’s invite already had me looking forward to winter. Chinese New Year is one of several East Asian celebrations tied to the lunar calendar, which begins sometime between late-January and mid-February. Vietnamese, Tibetan and Korean New Year festivities also occur during at the same time. I eventually hear from Peter that he plans to host a New Year dinner on a Saturday night, just a few days before the official holiday (which, this year fell on Tuesday, February 5th). 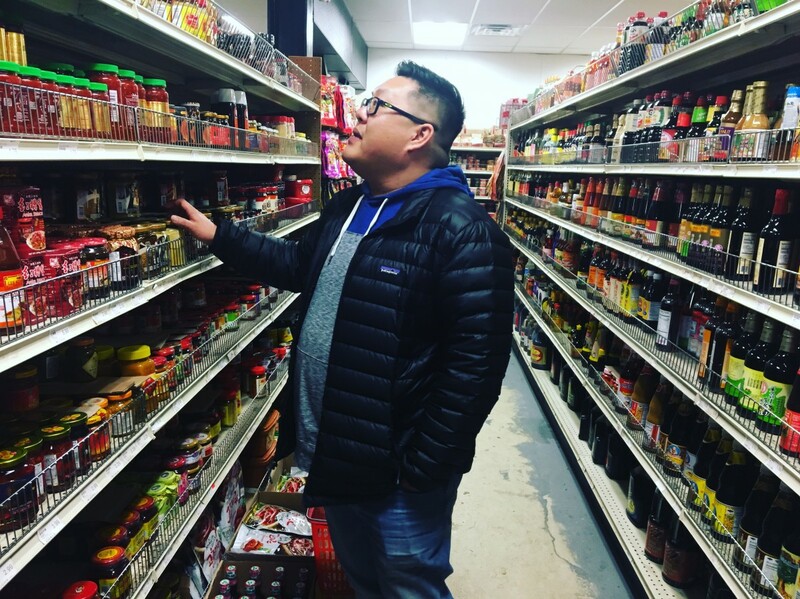 Since the ingredients he needs are hard to come by in Harrison County, Peter plans a shopping trip to an Asian market and fishmonger in Pittsburgh. He tells me I can come, “if you wanna ride with me all the way to the Strip District,” so I make plans to tag along. I wake up to near-whiteout conditions that morning. Dangerous road conditions have closed public schools in nearly every West Virginia county. I nix morning travel plans of my own and get in touch with Peter, certain he’ll cancel the trip. But a few hours later, I find myself in the passenger seat of his truck, and we begin our journey north. “Yeah, so we’re driving in about four or five inches of snow,” he says, laughing to himself as he merges onto a stretch of slush-covered highway where vehicles move along sluggishly, well below the speed limit. In a way, Peter’s right. We’re throwing caution to the wind, embarking on a road trip in a snowstorm for a few groceries. But I’ve never been invited to a dinner in West Virginia — especially one that involves dumplings — that was just about food. Peter moved to West Virginia in his mid-20s, taking a job as a chemical specialist at a manufacturing plant near Parkersburg. Immediately after his arrival, he made two significant purchases to mark his transition from city life: a truck and a deer rifle. He says his family members often question why he’d want to live in a place with no sizeable Asian-American population and few big-city amenities. But he says he cherishes Appalachian people for their humble, neighborly qualities that rarely showed up against the urban backdrop of his childhood. Peter’s adopted the mountains, and, for the most part, he says, mountain people have adopted him back. But for someone born into an extensive Cantonese-speaking family in a densely-populated Brooklyn neighborhood, Almost Heaven can seem like a far cry from home, especially when it comes to food. “Being in West Virginia does make me miss what I had growing up,” he says. Within a few miles of Peter’s house in Clarksburg, there are five Chinese restaurants, but there’s no sizeable Chinese population in Harrison County. The Americanized offerings available at these places can be delicious, he says, but they don’t match the traditional cuisine he learned from his father, a cook in a Chinese restaurant back in New York City. For the New Year celebration, Peter plans to make: Shumai — an open-topped steamed dumpling filled with pork, shrimp and shiitake mushrooms; Lo mai gai — sticky rice and chicken filling stuffed into lotus leaves and steamed; bok jam gai — poached, sliced chicken; Jing yi — steamed whole fish; and gon chow ngau ho — stir-fried beef and scallions with noodles in a brown, gravy-like sauce. On our drive he tells me more about the symbolism behind the menu, how each dish represents a specific tradition related to themes of wealth, prosperity and, especially, luck. “Luck is such a huge part of Chinese culture, especially around Chinese New Year,” he says. An affable guy who wears thick-rimmed glasses and a perpetual grin, Peter has an immense passion for food and a witty sense of humor — both of which I greatly appreciate. He often injects wisecracks and comedic anecdotes into conversations about otherwise weighty subjects, like the sentimental cooking of his father, who passed away several years ago. The conversation is fitting in the moment — I think we could use some luck. As we drive north, we pass a smashed navy-blue sedan being loaded onto a tow truck and then a gray minivan stuck between the north-bound and south-bound lanes. We hit an icy patch, causing us to skid ever-so-slightly, then we’re nearly side-swiped by a tractor-trailer crossing lanes. I notice serpentine patterns left by vehicles that skidded into the snow-filled median earlier in the day. Perhaps luck was at play, but just as we crossed over the Mason-Dixon Line into Pennsylvania, the snowfall and cloud clover were replaced by sunshine and crystal-clear blue skies. The road conditions were markedly improved. I think Peter’s words about lucky ingredients might just keep us safe. “Fat choy, yes, this way,” she responds, leading us to a display of dehydrated items packed in decorated cellophane pouches. “See,” Peter says, in his usual irreverent tone. “I told you it looks like pubic hair.” As much as Peter jokes about fat choy’s peculiar aesthetic, he understands its importance — his father would be using it were he still around. He places the small packet of fat choy into his shopping basket and we move on. As Peter grabs the ingredients on his list — dumpling wrappers and shiitake mushrooms; noodles and oyster sauce; dried lotus leaves and sticky rice — he points out other foods and teas and ferments and trinkets and medicinal herbs, describing their significance in Chinese culture, or within his family specifically. Separated by a hundred-or-so miles, the grocer in urban Pittsburgh and my farm in rural West Virginia are, in many ways, worlds apart. But moving down the aisles, I’m taken back to our hike through the woods in June, when we gathered fresh ingredients for dinner and told stories of my people along the way. When Peter points to a crate of taro root on the floor, the concrete surface feels almost parallel to the bed of damp, leaf-covered humus where I introduced him to May apples and large, late-season ramps. When he reaches up highly-stacked shelves for bottles of flavorful sauces and pastes, I think of towering shagbarks, from which I peeled rigid flakes of bark, demonstrating how to make sweet hickory syrup. I can’t help but notice how the market, though seemingly exotic and foreign to me, feels so comforting, so familiar — so Appalachian, in a sense. When we pass walls of dried vegetables and fermented pickles, I think of leather britches and sour corn preserved after summer’s harvest. An aisle of dried fish and Chinese charcuterie reminds me of salt-trout and venison sausage. When I see the frail hands of elderly women sifting through boxes of tapioca root and bitter melon, I recall my grandma sorting green tomatoes and squeezing cantaloupes to gauge their ripeness. He worries about portions and sequencing and timing and such. “My anxiety level for this dinner is sky high,” he says, and I sense the pressure he’s put on himself to get it right. When we meet up on Saturday afternoon, Peter’s assembling the shumai dumplings he’s talked about for months. They’re small, under two-inches wide, filled mostly with pork, shrimp and shiitake mushrooms. He cloaks them tightly in thin doughy wrappers, pinches them together and leaves the tops exposed. Sticky rice cooks on the stovetop. Dried lotus leaves soak in a large plastic container beside the sink. Stir fry ingredients marinate in a variety of sauces and spices. This is a moment Peter and I have both looked forward to, in different ways, for different reasons, since June. This comes to mind while Peter slices ginger root, and light smoke rolls out of a hot stovetop wok. There are three others huddled inside the small kitchen. There’s Lorenzo, of Spanish heritage; Vanessa, who’s mother immigrated from the Philippines, and her husband, Scott, from proud Polish roots. They talk about convening for other heritage-focused meals throughout the year, like when Lorenzo makes Spanish tapas, or when Vanessa cooks her mom’s chicken adobo. This is a snapshot of the West Virginia Peter’s claimed as his own — an accepting community willing to share something meaningful, anxious to pay it back with tokens of sincere curiosity. When dinner concludes, we’re full and satisfied, much like we were after the first meal we all shared in June. We’re indoors, but the scene feels the same. On the table before us is a disheveled scene of glassware, empty dinner plates and serving bowls. I see a rectangular platter that still contains a few pork shumai, and, knowing how meaningful dumplings can be, I think Peter’s dad probably would have been proud. As a West Virginia-based cook who geeks out on heritage food, I’m often asked to define Appalachian cuisine. This is generally something I despise. I’ve had West African stews and Peruvian empanadas from cooks born in far-away places who are damn proud to live here now. I’ll always consider those dishes more Appalachian than the ramp-infused “humble cuisine” of big-city chefs who’ve never foraged the north-facing slopes of a holler, and probably never will. Sometimes, when asked, I’ll respond with a few words about a resourceful place-based culture, or a knack for ingenuity that fostered nourishing abundance from limited means — or a number of other arbitrary qualifiers, depending on my mood. Almost always, I’ll backtrack to acknowledge the region’s constant evolution, with the arrival of new residents, often immigrants, that embody more of certain traits — reverence for cultural heritage, connection to the land, desire to build community — than most folks whose families have been here for six or more generations. There’s obviously more to it, but these are qualities I look for when pondering Appalachianness — or what I want it to mean, anyway. I mull this over this as I’m driving home from Peter’s dinner, late at night, alone on the highway, under pitch-black skies. I think about our hike in June, our road trip through the snow and the ambassadorial power of dumplings. I’m convinced a traditional Chinese spread for Lunar New Year was the most Appalachian meal I’ve had in quite some time. It’s after 1 a.m. when I finally get home and put a container of leftovers in the fridge. Through the clear plastic lid, I can see strands of fat choy, and I believe in their symbolism. In that moment, I feel very, very lucky. Jesse Wright, news director at West Virginia Public Broadcasting, sat down with Mike Costello, food editor at 100 Days in Appalachia, Monday morning for WVPB’s West Virginia Morning program. Listen to that discussion or read excerpts from Jesse Wright’s discussion with Mike Costello below. ANTHONY BOURDAIN’S “PARTS UNKNOWN” AIRED LAST NIGHT (SUNDAY) ON CNN. YOU WERE A PART OF THAT SHOW. YOU WANT TO TALK A LITTLE BIT ABOUT WHAT THAT EXPERIENCE WAS LIKE? You know, you go through this wide range of feelings and emotions when something like that happens … I’m not going to lie — it’s totally an honor. To just sort of feel like somebody is paying attention to the work you’re doing and you get sought out for something like this. And that’s really a good feeling. I think it is a testament, not necessarily to my work and to Lost Creek Farm’s work, but to the work of the sort of broader food community that we work with that makes us who we are. And we really tried to show that off in the show. We tried to make sure that our food community was really well-represented, from the seed saver who have been saving seed for six generations or more, and have given us that seed so that we can keep growing that in our garden, to traditional sausage makers, or traditional bakers, or food justice advocates, or young farmers just like us who kind of end up making a lot of sacrifices to do what they do. You know, this is the community that we always sort of weave into our stories, and that’s really the story that we wanted to tell on CNN. But you know, there’s this other side of it, and I think the more accurate answer of how that experience was is that it’s really freaking stressful. You know, it’s stressful for a few reasons. One of which was just that we’re in the middle of a giant deconstruction, reconstruction project. We’re fixing up an old 1800-era farmhouse that we kind of had to take down to the bones and then build back up. … But even outside the filming and after the film crew left, there’s this stress that comes with the pressure of trying to tell the story accurately — trying to tell your story accurately, trying to tell the state’s story, and trying to tell the region’s story. WELL, SPEAKING OF YOUR WORK AND YOUR CONNECTION TO MEDIA, YOU’RE NOW CONTRIBUTING EDITOR AT 100 DAYS IN APPALACHIA, WHICH WEST VIRGINIA PUBLIC BROADCASTING IS A PART OF, ONE OF THE EDITORIAL COLLABORATORS. THERE’S SOME NEW WORK THAT’S COMING OUT WITH THE PROJECT. YOU WANT TO TALK A LITTLE BIT ABOUT WHAT’S ON DECK? Sure. 100 Days in Appalachia, for those who aren’t familiar with that project, it was sort of a project that was born out of kind of a response to the media coverage surrounding the 2016 election. It was during a time in which Appalachia was portrayed, and further than it already had been, by sort of a sense of homogeneity in our ideology, in our cultural background. And it was this situation where media was coming to West Virginia day after day to tell this story of these poor, desperate white voters in Trump Country. And it was just this singular narrative that we knew we had to combat somehow. So 100 Days in Appalachia was conceptualized out of the necessity to provide a rebuttal there, and to provide a counternarrative that provided a more accurate snapshot of the region, and provided a little bit more — actually a lot more — nuance and complexity to the narratives that the national media was putting out each day. I think that there are a lot of parallels to be drawn between the 2016 election coverage of Appalachia and the kind of constant media hype that we’re seeing around Appalachian food as the trend. When the food media tends to talk about Appalachian food, we’re seeing a lot of Appalachia being pigeonholed and simplified, and all of that nuance and complexity that is so important to our political reporting is also missing from food reporting. And when you think about food being a mark of culture, of people tied to place, you know you want the stories about food to really reflect all of that deep, complex relationship that we have with the land here. We want it to reflect the great level of diversity that Appalachia has here. So through 100 Days in Appalachia, with all of this in mind, we’re going to launch an online food publication that’s associated with 100 Days sometime this summer, probably in June. We already have quite an impressive team of some contributors assembled to really tell that story that we want to tell through food, and to look at this project through 100 Days in Appalachia as something different, as an episode of “Parts Unknown” where people think it’s this one-and-done opportunity to tell a story. You know, this is a platform that we have, and that we’ve developed knowing that there are so many stories to tell, and so many people who need to be telling those stories. That we’re going to do more than what a single TV episode can provide. SO MIKE, AS YOU REFLECT ON THE “PARTS UNKNOWN” EXPERIENCE, AS WELL AS CONSIDER THE LAUNCH OF THIS NEW FOOD PROJECT, WHAT DO YOU HOPE THAT YOUR AUDIENCE TAKES AWAY FROM THE WORK THAT YOU’RE DOING? Well, that’s a good question, and I think that there are different answers to that, depending on whether I consider the sort of internal audience — what’s in West Virginia and what’s in Appalachia — and external audience. Certainly through both the work that I do as a chef and as a farmer with Lost Creek Farm, and then also as a journalist and an editor with 100 Days in Appalachia, you know we want to tell a story about this place that is more fair and just and accurate than the stories that people are used to hearing. So I’m always thinking about how we can tell a story about diversity and complexity, and food is a great way to do that. So that’s something that I think about when I’m thinking more about an external audience. And then for an internal audience, I think a lot about my own experience when I grew up and when I was a teenager. When I was about 16 or so, I decided that I wanted to be a chef. And I don’t think I really at the time wanted to be a chef that specialized in regional cuisine so much. I just was sort of drawn by the creativity of being in the kitchen and cooking. But there were certain things that happened in that experience that connected some dots for me about just the way Appalachian culture and heritage was being valued, both inside and outside the region. One of those in the restaurant world was just working in restaurants, where the perception of quality had to do with more about how exotic the ingredients were than how locally and how rooted in place they were. And that was a total turn-off to me. I mean, it was like anything that was kind of considered West Virginian or Appalachian was seen as inferior, so we sort of had to create this distance between ourselves and something that was considered Appalachian. So I think there’s a lot of overlap in the way that I approach cooking and farming, and the way that I approach this journalism project through 100 Days in Appalachia. Because it’s like when you’re talking about food from the region, the story is by far the most important ingredient that there is. This interview was originally produced by West Virginia Public Broadcasting. 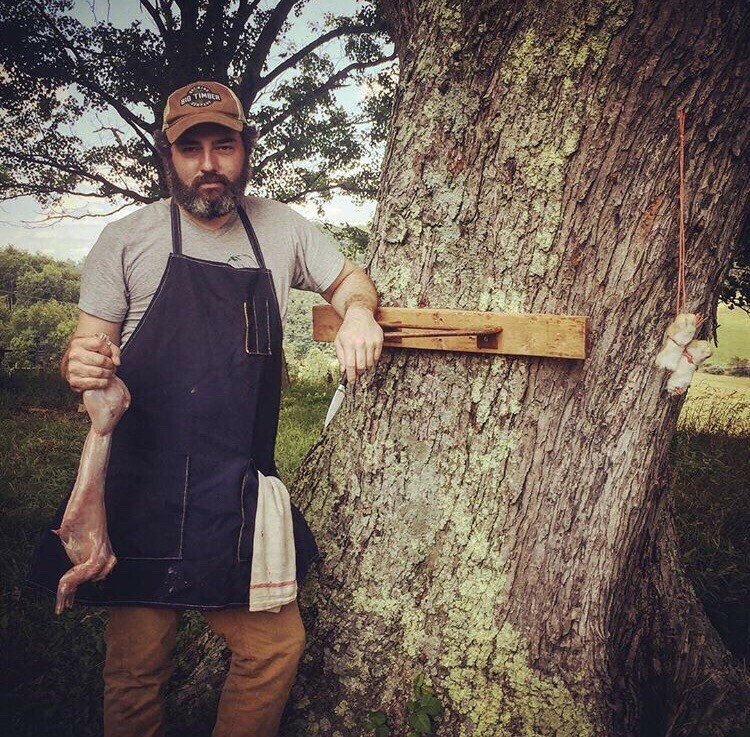 Food editor Mike Costello (@costellowv‏) is a chef, farmer and storyteller at Lost Creek Farm in Harrison County, West Virginia. Through his cooking and writing, Mike strives to tell important stories about a misrepresented and misunderstood region he’s always called home.